I never know who might show up at a White Sox game on any given night, and May 3rd wasn’t any different. On this day the word was pop music sensation Justin Bieber would be stopping by U.S. Cellular Field to toss a ceremonial first pitch prior to the game between the White Sox and Royals. Pop music sensation Justin Bieber poses with with White Sox pitcher Mark Buehrle after throwing a ceremonial first pitch on May 3, 2010. Suddenly, my world flipped upside down! Rather than easing into the homestand after a week away from the ballpark, I felt pressure similar to covering one of my 19 World Series! I had to make certain that pictures of Justin were made with selected VIP guests. No problem, even though I wasn’t sure when or where these photos would happen. Just be sure to make them happen. Even White Sox manager Ozzie Guillen jokingly let me know just how high the stakes were by mentioning “You better not mess up, or you’re fired”! Thanks, Ozzie! I always welcome a little added pressure! Pop music superstar Justin Bieber takes time to sign autographs for his fans prior to the May 3 White Sox game. Everything ended up working out well as I knew it would. By the second inning, 8×10 photos were printed and digital files delivered to our Communications Department for distribution. All was well. After the dust settled, I took time to reflect back to some of my personal favorite “celebrity moments” from over the years at U.S. Cellular Field. 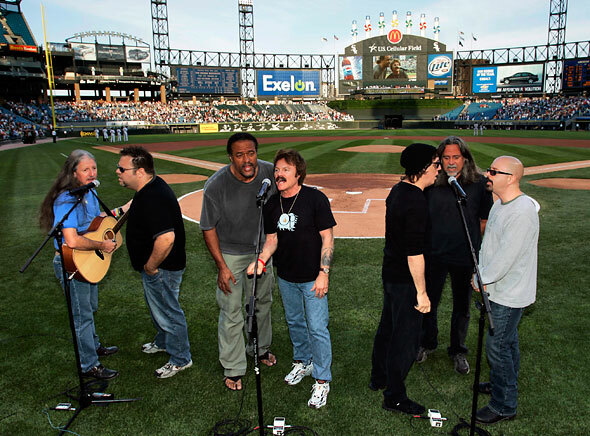 My favorite has to be when the Doobie Brothers stopped by The Cell to perform prior to a game in 2005. Being a wanna-be rock star back in the day, the Doobies were my favorite band. Having the opportunity to photograph them up close was a thrill. Rock icons The Doobie Brothers perform prior to a game at U.S. Cellular Field in 2005. What could be even better than that? Getting MY photo taken with the band! Not often am I on the other side of the lens, but this was different. I was living the dream that day for sure! Their road manager didn’t seem to think they needed a second bass player though. Dream shattered. 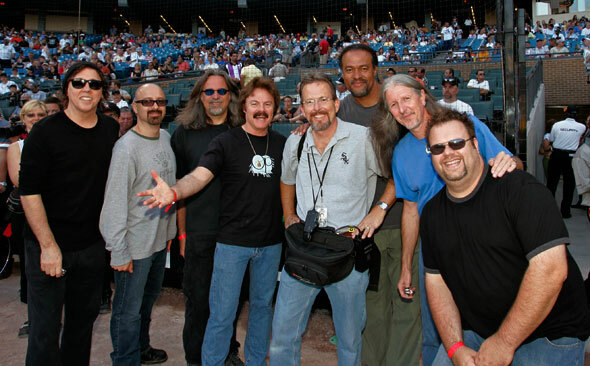 Photographer Ron Vesely poses with members of the Doobie Brothers prior to a White Sox game back in 2005. How about Apollo 13 astronaut James Lovell stopping by to commemorate the 40th anniversary of that mission and the famous line “Houston, we have a problem”. Definitely a moment in our history we won’t ever forget. It was only fitting to have Jim in the house on this day because in 2005, Houston dealt with a different sort of problem. One related to this very ballpark. The Chicago White Sox! Apollo 13 astronaut Jame Lovell stopped by last month on the 40th anniversary of that famous mission. Actor Jeremy Piven threw out a first pitch to bring attention to his cause “Malaria No More” on World Malaria Day a few weeks ago. I’m a big fan of Entourage, so it was fun to see “Ari” out at the ballpark. I couldn’t find Lloyd, however. I thought for sure he would be within shouting distance. Actor Jeremy Piven poses for a photo with White Sox pitcher Mark Buehrle. Then there was Game 2 of the 2005 American League Championship Series when a certain Illinois senator, who went on to bigger things a few years later, threw out a ceremonial first pitch. Future United States President Barack Obama prepares to throw out a ceremonial first pitch during the 2005 ALCS. 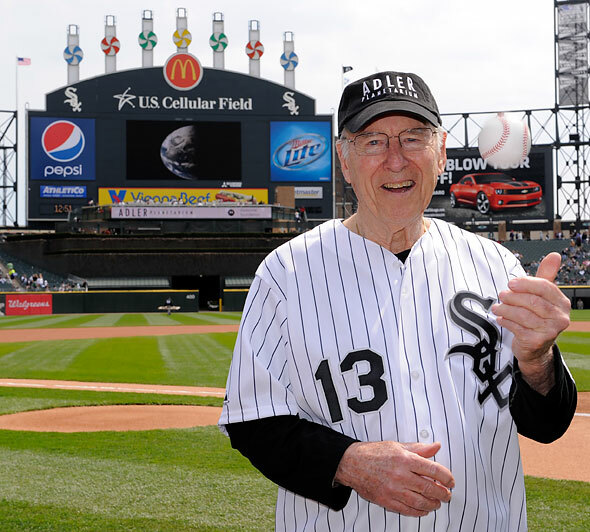 Do you have any favorite celebrity moments from U.S. Cellular Field to share with me? I’d love to hear about them. Perhaps I can put together a “Top Ten Readers Choice” photo gallery based on your input. Let your voice be heard! Steve Perry joins A.J. Pierzynski, Aaron Rowand and Joe Crede for a little singing after the White Sox won the 2005 World Series. All in all, it might be hard to beat the magic that former Journey lead singer Steve Perry brought to the White Sox (special thanks to AJ, Aaron and Joe) with the “Don’t Stop Believin'” revival enjoyed during the 2005 World Series year. Hollywood couldn’t have scripted a better ending for that story! In the meantime, don’t forget to keep your eyes open for celebrity sightings when taking in a White Sox game at U.S. Cellular Field. You never know who might be in the house! This entry was posted on Friday, May 7th, 2010 at 4:10 PM	and is filed under Chicago White Sox. You can follow any responses to this entry through the RSS 2.0 feed.